Troy Alan Disselhorst, 46, of Palmyra, MO passed away at 10:20 PM Monday, December 3, 2018 at his home. Funeral Services will be at 11:00 AM Friday, December 7, 2018 at the Lewis Brothers Funeral Chapel in Palmyra, MO. Pastor Wes Gehrke will officiate. Burial will be at Greenwood Cemetery in Palmyra. Friends and family are invited to Troy's Life Celebration at a visitation that will be held from 3:00 PM - 7:00 PM Thursday, December 6, 2018 at the Lewis Brothers Funeral Chapel. Troy was born January 30, 1972, in Palmyra, MO to Richard and Lois Kruse Disselhorst. He was married to Emily Ann Bross on May 20, 2016 in Palmyra, MO. She survives. Other survivors include his parents, Richard and Lois Disselhorst of Palmyra, MO; three brothers, Steve Disselhorst of Palmyra, MO, Ken Disselhorst (McKenzie) of Hannibal, MO, and Rick Disselhorst of Columbia, MO; his mother and father in law, Steve and Barb Bross of Palmyra, MO; grandmother in law, Sally Bross of Palmyra, MO; two sisters in law, Lisa Bross Hunziker (Anthony) of Kahoka, MO and Macy Bross of Kahoka, MO; two nieces, Quinn Disselhorst and Mallory Hunziker; and two nephews, Connor Bross and Hunter Hunziker. Troy was preceded in death by his maternal grandparents, Harold and Marie Kruse, and his paternal grandparents, Pete and Frances Disselhorst. In his younger years, he attended Zion Lutheran School and graduated from Palmyra High School in 1990. In high school, he played football and was a part of the Future Farmers of America, where he earned his American FFA Degree. Troy was also a delegate on the National 4-H Congress in Chicago, IL. Troy won the John Danforth Award as well. 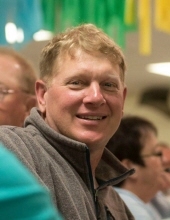 Troy was a longtime member and treasurer of Palmyra Young Farmers, he was also a member of both the Missouri Cattleman's Association and the National Cattleman's Beef Association. For many years, Troy served as an honorary coach at the Tony Lenzini basketball tournament. He was a supporter of Palmyra's Project Graduation. Troy was also a 12-year member of Marion Boosters 4-H Club. Recently, Troy was serving on the local MFA Board of Directors. An avid football fan, Troy supported Palmyra and Mizzou football, where he enjoyed tailgating and was a Pittsburg Steelers fan. Troy also enjoyed playing X-Box with his nephew Connor. He took pleasure in group trips with his many friends and loved traveling with his wife, Emily. Most of all, Troy loved his family and friends and the time he was able to spend with them. Troy was a member of the Zion Lutheran Church. Memorial contributions may be made to a future project for Palmyra Football Department to be determined at a later date checks made payable to Emily Disselhorst, various local cancer charities checks made payable to Emily Disselhorst,or to the Zion Lutheran Church. Pallbearers will be Greg Bross, Bill O'Brien, Mike Trower, Dunstan Disselhorst, Doug Kroeger, Kurt Nelson, Brian Dorsey, Tim Browning, Alan Comstock, and David Disselhorst. Honorary pallbearers will be David O'Brien, David Carlstead, Doug Disselhorst, Troy Ragar, Brent Begley, and Travis Coleman. To send flowers or a remembrance gift to the family of Troy Alan Disselhorst, please visit our Tribute Store. "Email Address" would like to share the life celebration of Troy Alan Disselhorst. Click on the "link" to go to share a favorite memory or leave a condolence message for the family.